Hayden Bush picks up a GWOC win in Greenville’s 4-1 win over Stebbins. GREENVILLE – The Greenville baseball team defeated the visiting Stebbins Indians 4-1 in a Wednesday night GWOC game. Coach Blumenstock tabbed his third freshman of the season to start on the mound calling on Hayden Bush to throw against the Indians. All the runs on the night came in inning No. 3 with Stebbins taking a 1-0 in the top of the third. The Green Wave battled back to plate four runs in their half of the inning starting with a leadoff double to right off the bat of Tytan Grote. Grant Minnich legged out a bunt to put runners on first and third setting up a Tyler Beyke RBI single scoring Grote and a 1-1 score. Ethan Saylor drilled a 2-run double to center scoring Minnich and Beyke to give Greenville a 3-1 advantage. Landon Eldridge beat out an infield single putting runners on first and third before a Troy error on a Terry Miller smash to short plated scoring Saylor for the final run of the night but not before Stebbins threatened in the top of the seventh inning. Stebbins opened the seventh with a groundout to Kole Francis at second followed by a single and a double to put runners on second and third. Wave freshman Warren Hartzell fielded a bad-hop smash to third and threw bullet to Minnich at the plate to register the second out of the inning and keep the Indians from scoring. Bush tossed 4.2-innings, allowing 1-run on 2-hits and striking out three. Hanes pitching in relief struck out the final Stebbins hitter to record the same and preserve the win for Greenville. The speedy Green Wave team stole five bases on the night while Reed Hanes was tossing 2.2 innings in relief to earn a save. Eldridge went 2-3 on the night and Saylor was 1-2 with 2-RBIs and a run scored. Beyke went 1-3 with a RBI, Grote was 1-2 with a run and Terry Miller accounted for a RBI. Greenville improves to 3-3 on the season. 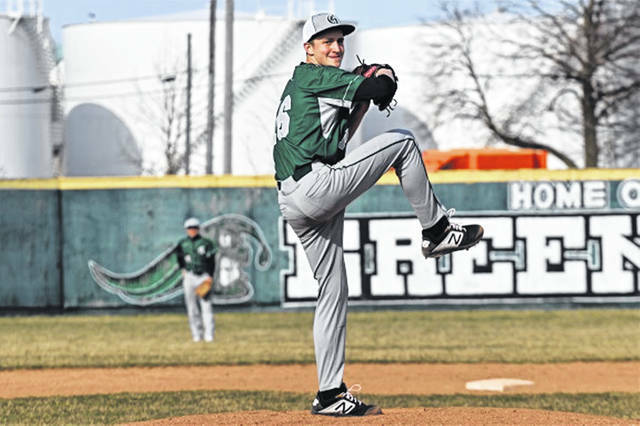 https://www.dailyadvocate.com/wp-content/uploads/sites/34/2019/04/web1_Hayden-Bush.jpgHayden Bush picks up a GWOC win in Greenville’s 4-1 win over Stebbins.